Microsoft’s powerful collaboration and communication tool with Britannic’s cloud experts’ managed service wrap. Skype for Business is a powerful tool created to meet the demands of today's fast-paced business world. Designed with Microsoft's Practical Guidance for Cloud Voice in mind, Britannic Embrace is the service wrap that puts the delivery and management of your Skype application into the hands of cloud experts. Skype for Business offers instant messaging, presence, voice, audio and video conferencing as well as content sharing, to eliminate the need for traditional telephone and conferencing systems. It integrates with the familiar office tools of Office 365, providing easy, effective and secure communication and collaboration with customers, suppliers and partners. Discover the key features and benefits of Britannic Embrace for your Skype for Business platform! We concentrate on your communications, so you can focus on business. Britannic’s expertise goes beyond collaboration, helping you to extend your communications with complete solutions tailored to your needs. Contact centre, call recording and networking solutions are all at your fingertips. Britannic gives you the choice and flexibility to operate how you choose. With 30 years’ experience in voice communications and workplace technology, you can be confident of the result. Work like you’re all in one room, even when you’re not. Skype for Business makes online meetings a reality. Office 365 incorporates the productivity tools for the modern workplace, combining Office favourites with next-generation applications, including Skype for Business. With over 85 million users worldwide, Office 365 is fast becoming the productivity suite of choice for SMBs to improve communication, collaboration, efficiency, and productivity. Embrace is a service wrap that aligns service delivery with your business objectives, giving or taking as much control as you require. Our highly skilled experts can design, build and manage your day-to-day communications and network operations. 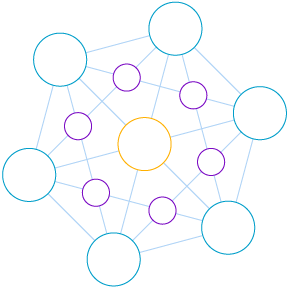 It frees up your team to drive IT strategy and business innovation forward. 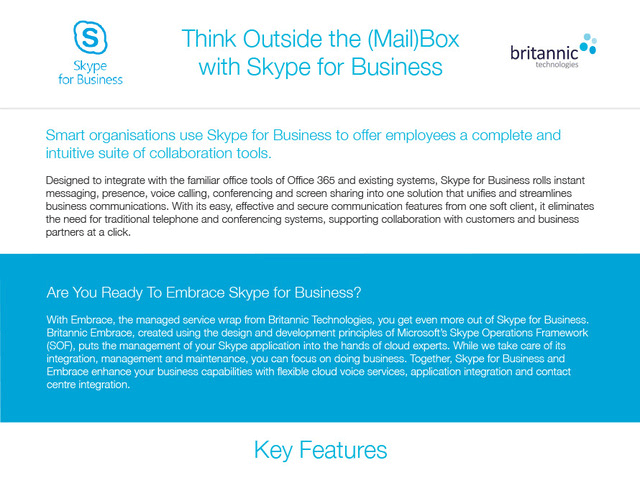 Discover the key features and benefits of Britannic Embrace for your Skype for Business requirements. Cloud voice expert and systems integrator with 30 years’ experience in UC, real-time communications, networking and contact centre technologies, Britannic Technologies builds strong technology partnerships with customers across 27 countries worldwide to innovate communications and transform the way they do business. Quality and security accredited (ISO 9001, ISO27001 and ISO22301), Britannic designs, delivers and develops ICT services with its own SIP and cloud platform and supports customer solutions with premium engineers and IT developers and manages the whole system for you with its cloud wrap, Embrace. Embrace for Skype for Business incorporates a three-stage process based on Microsoft's Practical Guidance for Cloud Voice. Following the steps will help you get the best from Skype for Business. We schedule our Prince 2 qualified Project Management Team ready for "Onboard"
Enhance — We ensure your service is always up to date. Book today and learn how you can supercharge your communications with Skype for Business and Embrace!